Native to Japan the Kingsville Boxwood is an extremely slow growing tree. 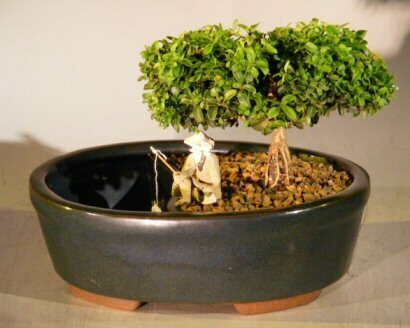 It has the smallest leaf of all Boxwoods which is why it is sought after for bonsai. The Kingsville Boxwood is an evergreen tree with light green leaves and has excellent branching characteristics. A great indoor bonsai tree recommended by the Brooklyn Botanical Gardens. Includes fisherman figuring, line and ceramic fish.